NANAIMO BIRD REPORT “EXPLORE NATURE---GO BIRDING"
The Sunday bird walk went to Rathtrevor Provincial Park in Parksville. The morning was sunny and warm with fog over the water. Not a lot was happening on the water with the fog but we were able to see a few gull species, a pair of cormorants and Red-breasted Mergansers. A highlight of the walk was an Orange-crowned Warbler moving about in the shrubs near the beach and the Merlin put on a show for us while it was in hot pursuit of a Golden-crown Sparrow, which was able to elude the Merlin. Northern Pygmy Owl was seen at the top of Little Mountain in Parksville. Mourning Dove was seen after today’s bird walk at Rathtrevor Provincial Park. It was seen in the fenced off area near the entrance to the beach from parking lot #1. A Eurasian Wigeon and Green-winged Teal were seen in the Englishman River Estuary on the Plummer road side. Black-throated Gray Warbler was also seen a the Englishman River Estuary but on the Shelley road side. A large flock of Greater White-fronted Geese were seen over and making a quick stop at Buttertubs Marsh but not staying around. A Short-billed Dowitcher was seen at the Englishman River Estuary. 74 Heermann’s Gulls were seen at the mouth of Nile Creek at Qualicum Bay. On Friday September 26 about 140 Heermann’s Gulls were seen. Swamp Sparrow was seen at Buttertubs Marsh near the viewing tower on the west side. Also Veery was also seen at Buttertubs Marsh, seen in the North West corner of the marsh feeding on Arbutus berries with the American Robins. Great Horned Owl was seen and heard near the tall viewing tower at Buttertubs Marsh on Wednesday evening. A Brant was seen off of Deep Bay. The Tuesday bird walk went to the Plummer Road side of the Englishman River Estuary in Parksville. There was light rain at the start, becoming heavier, with winds by the ocean, and then ending again with lighter rain. We were lucky enough to sight 6 Greater Yellowlegs feeding in the flats, as well as 8 Long-billed Dowitchers. There were also several sighting of Savannah Sparrows feeding along the grassy shoreline. A great highlight of the morning was spotting 4 Heermann's Gulls at the shoreline a short distance from the other gulls. We also caught good views of some Western Sandpiper near the end of the walk. 10 wet but happy birders saw or heard the following 35 species. Great Horned Owl was seen near the top of the spillway at Colliery Dam Park in Nanaimo. The Tuesday bird walk on September 30, 2014 will be going to Columbia Beach in Parksville. Meet at Parksville Community Park at the parking lot near the Lions Club Playground at 9:00 a.m. or at the beach access of Columbia Beach off of Admiral Tyron Blvd, at about 9:10 a.m. The Sunday bird walk on October 5, 2014 will be going to Buttertubs Marsh in Nanaimo. Meet at the Bird Store at 9:00 a.m. or at the parking lot at the end of Buttertubs Drive of Bowen road at about 9:10 a.m.
Nanoose Naturalists Meeting, October 9, 2014 - 7:00 P.M.
Nanoose Library Hall in Nanoose Bay. The speaker will be local naturalist, Bill Merilees who will talk about Middlenach Island. Bill spent a summer on the island 50 years ago as a young naturalist when it was first designated a protected park. Bill was back this past summer and has written about all of the changes he observed there. Everyone welcome for this talk. 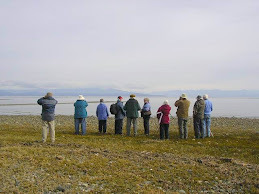 The Sunday bird walk went to the Shelley road side of the Englishman River Estuary in Parksville. The morning was sunny and warm and the tide was high. We spotted an American Dipper along the river’s edge at the beginning of the walk and heard a Hutton’s Vireo calling near the parking lot. A few birders also got a quick look at a Black Headed Grosbeak just before it flew. At the end of the walk in the parking lot there was a Black Swift and a Sharp-shinned Hawk over head. Two American Pipits were seen at the top of Sugar Loaf Mountain in Nanaimo. Steller’s Jays have been reported in many areas around Nanaimo, Nanoose Bay, Parksville and Qualicum Beach area. It is the first time in the last three years we have seen this much activity with Steller Jays visiting backyards. The Tuesday bird walk went to the Little Qualicum River Estuary in Qualicum Beach. The morning was sunny and warm with little breeze. The ocean birds are starting to return as we had sightings of Scoters, Loons, Grebes, Cormorants and a variety of gulls. We also had a sighting of a Stellar Jay and Dark-eyed Junco near the parking area. Near the end of our walk we watched a Merlin fly into a conifer in an unsuccessful attempt to capture prey. Then just as we were leaving we sighted a Greater Yellowlegs, Killdeer and 2 Western Sandpipers feeding on the estuary side of the parking lot. Rufous Hummingbird was seen at a feeder up at Little Qualicum River Village. 6 Horned Larks along with 200 Surfbirds, American Pipit and 4 Turkey Vultures was seen on Entrance Island just off Gabriola Island. The Tuesday bird walk on September 16, 2014 will be going to Rathtrevor Provincial Park in Parksville. Meet at Parksville Community Park at the parking lot near the Lions Club Playground at 9:00 a.m. or at the parking lot #1 at Rathtrevor Provincial Park at approximately 9:10 a.m. The Sunday bird walk on September 21, 2014 will be going to Piper’s Lagoon in Nanaimo. Meet at the Bird Store at 9:00 a.m. or at the parking lot of Piper’s lagoon on Hammond Bay road at about 9:10 a.m.
Tuesday, September 02, will be going to the Shelly Road side of the Englishman Estuary in Parksville. Tuesday, September 09, will be going to the Little Qualicum River Estuary in Qualicum Beach. Tuesday, September 16, will be going to Rathtrevor Provincial Park in Parksville. Tuesday, September 23, will be going to the Plummer Road side of the Englishman River Estuary in Parksville. The Sunday bird walk went to the Neck Point Park in Nanaimo. The morning was sunny and warm. We spotted two Marbled Murrelets on the bay near Shack Island giving us great views. We saw and heard many Chestnut-backed Chickadees throughout the morning. Six American Pipits flew from the park across the Strait of Georgia. A Black-throated Grey Warbler and Warbling Vireo were seen at the parking lot as we finished the walk. Double-crested Cormorant, Pelagic Cormorant, Marbled Murrelet, Great Blue Heron, Thayer’s Gull, California Gull, Glaucous-winged Gull,Belted Kingfisher, Anna’s Hummingbird, Downy Woodpecker, Northern Flicker, Steller’s Jay, Common Raven, Northwestern Crow, Chestnut-backed Chickadee, Red-breasted Nuthatch, Brown Creeper, Bewick’s Wren, Warbling Vireo, Black-throated Grey Warbler, Yellow-rumped Warbler, Chestnut-backed Chickadee, American Robin, Savannah’s Sparrow, American Pipit’s, Song Sparrow, Spotted Towhee, American Goldfinch and Pine Siskins. Ten American Pipits were seen near the mudflats on the Plummer Road side of the Englishman River Estuary in Parksville. Fifty Greater White-fronted Geese were seen flying over Departure Bay in Nanaimo. A Western Tanager was seen along Rutherford Road in Nanaimo. Four Black-throated Grey Warblers and American Goldfinch were seen near Peterson Road and Millard Drive in Lantzville. It was the first Tuesday that we have seen rain all summer and the Tuesday bird walk resumed for the year! We went to the Shelly Road side of the Englishman River Estuary in Parksville. The morning saw light rain then heavy rain then no rain and finished off with heavy rain. The big highlight of the morning was the rare sighting of an American Redstart with a flock of Chestnut-backed Chickadees in the bushes next to the viewing platform. American Robins, Western Tanagers, Orange-crowned Warblers, a Yellow Warbler, a Warbling Vireo and a Willow Flycatcher were spotted feeding in a berry bush further from the viewing platform. An Pelagic Cormorant, a Pacific Loon, Common Loons, Bonaparte's Gulls and California Gulls were seen on the Strait of Georgia. Twelve birders including a visiting birder from England saw and heard the following thirty-two species. Anna’s Hummingbird, Belted Kingfisher, Northern Flicker, Northwestern Crow, Common Raven, Orange-crowned Warbler, Yellow Warbler, American Redstart, Warbling Vireo, Willow Flycatcher, Chestnut-backed Chickadee, American Robin, European Starling, Western Tanager, Spotted Towhee, Song Sparrow, Savannah Sparrow and American Goldfinch. Warbling Vireo: Ralph Hocken Photo. 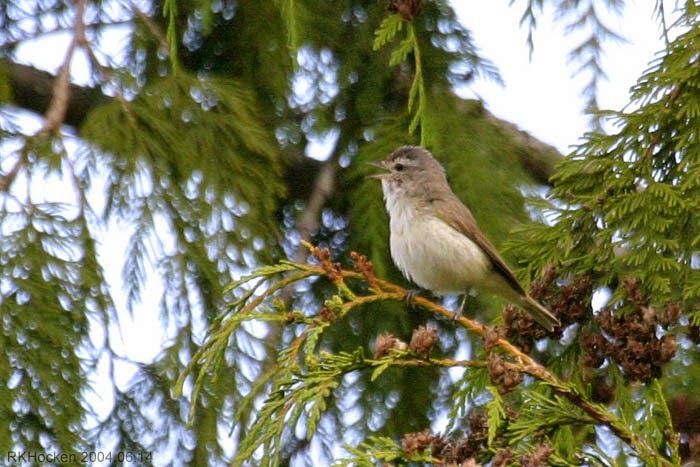 A Cassin’s Vireo was spotted in Lantzville. Least Sandpiper, Western Sandpiper, Semipalmated Sandpiper, Black-bellied Plover and Long-billed Dowitcher were seen at the Englishman River Estuary in Parksville. A Greater Yellowlegs was seen at French Creek. The Tuesday bird walk on September 09, 2014 will be going to the Little Qualicum River Estuary in Qualicum Beach. Meet at Parksville Bay at the parking lot near the Lions Club Playground at 9:00 a.m. or at the Brant viewing platform in north Qualicum Beach at about 9:20 a.m. 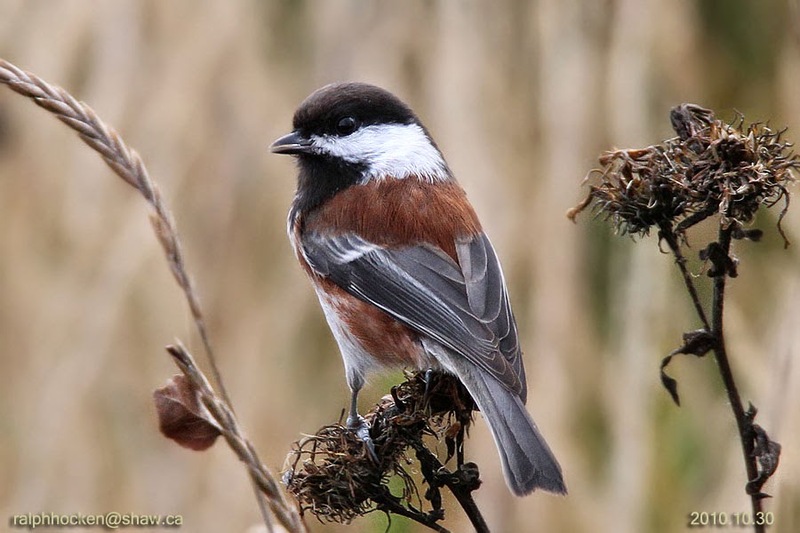 The Sunday bird walk on September 14, 2014 will be going to the Shelly Road side of the Englishman River Estuary in Parksville. Meet at the Bird Store at 9:00 a.m. or at the end of Shelly Road on the Oceanside of highway 19a in Parksville at about 9:30 a.m.
Nanoose Naturalists Meeting, September 11, 2014-- 7:00 P.M.